freedom is expensive, paid up front! 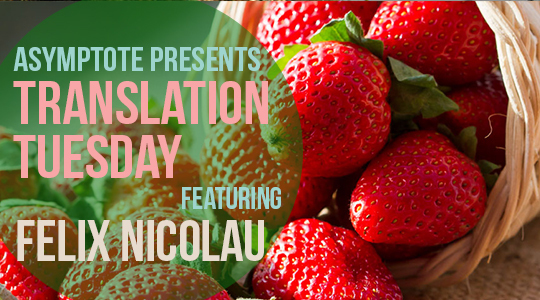 This Tuesday, we’re excited to share a new poem by the Romanian poet, Felix Nicolau, whose work is a cutting and humorous comment on life for those crossing borders and coming into contact with other cultures, yet who are still at the very bottom of the social ladder. is President Iliescu around—the sun will come out! didn’t they march through the springtime quarter or through the slums? Hooray President Goatee! Did he eat salami with soy like all of us? Boo, Goatee! we won’t sell our country out! freedom is expensive, paid up front! Give us money to stay up front! Felix Nicolau is Professor in the Faculty of Theology and Literature, Lund University, Sweden. He is the author of eight books of literary and communication theory, five volumes of poetry (Kamceatka—Time IS honey, 2014) and two novels. He is member on the editorial boards of The Muse—an International Journal of Poetry and Metaliteratura magazines. His areas of interest are translation studies, the theory of communication, comparative literature, cultural studies, translation studies, British and American studies, and Romanian studies. He is also swims, rollerblades, and rides a scooter. Sometimes he even reads more than writes. MARGENTO (Chris Tănăsescu) is a poet, performer, academic, and translator who has lectured, launched books, and performed in the US, Southeast Asia, Australia, and Europe. His pen name is also the name of his multimedia cross-artform band that won a number of major international awards. He is co-author of poetryartexchange, his co-translations with Martin Woodside from Gellu Naum’s poetry (Athanor and Other Pohems) were nominated by World Literature Today as Most Notable Translation in 2013, and he has written the libretto for a rock opera composed by Bogdan Bradu. He deploys networks-of-networks and natural-language-processing algorithms in his collaborative poetry, and continues his work on the graph poem project together with Diana Inkpen and their students at the University of Ottawa. MARGENTO is Romania & Moldova editor-at-large for Asymptote. Martin Woodside is a writer, teacher, scholar, and founding member of Calypso Editions. He is an interdisciplinary scholar who earned his MFA and a certificate of specialization in Children’s Literature from San Diego State University and his Ph.D. in Childhood Studies from Rutgers-Camden in 2015. He ​has written five books for children, a chapbook of poetry (Stationary Landscapes, Pudding House), and a full-length collection of poetry (This River Goes Both Ways, Wordtech). His translations of Romanian poetry have appeared in several books and journals, including The Kenyon Review Online, Asymptote, and the Brookyn Rail’s inTranslation. He’s published two collections of Romanian poetry in translation: Of Gentle Wolves, an anthology of contemporary Romanian poetry, and—along with MARGENTO—Athanor & Other Pohems, collecting the work of the brilliant surrealist Gellu Naum.